If you are responsible for a dance, theatrical, performing arts, sports or aerobic surface, you need to develop a maintenance program. For every flooring system, there are a number of factors that impact cleaning frequency, equipment and supplies needed. First, determine which maintenance factors are most important. Second, decide if you are going to maintain the floor(s) yourself or hire a professional. Even if you have determined to do it yourself, get a quote from a professional. You will have a better idea of process, time and cost. Most flooring maintenance professionals have no idea what you need for your floor. By and large, appearance is their only objective. They are apt to leave you with a bright, shiny and very slippery floor, unless you are there to tell them exactly what you need. Your floor is no different than your car, you have to maintain it or it will not work. Every floor made by every manufacturer needs a maintenance program appropriate for the floor, its use(s) and the conditions and circumstances under which it was installed. It does not matter how much money you spent on your flooring system, or if you have a high-end specific-use flooring system, you need to initiate a maintenance program or your floor will eventually fail. Appearance – A sloppy looking floor makes for an undisciplined environment. This is not a message or core value we want to impart to our customers and students. Health – A good maintenance program takes into consideration the health of the people working on it. Bacteria, fungus, mildew and dirt can impact end users in ways that all spell trouble. Performance – A well-maintained flooring system contributes to the desired result of the end-user. A floor compatible with what you want to do makes for better performance. Better performance makes happier instructors, students, customers, and artists. Safety – The primary reason people invest in flooring is to provide a safe environment. Neglecting your floor’s proper maintenance can jeopardize safety. Taking care of your floor means you won’t have to take care of injured dancers. Reliability – Consistency and reliability are the cornerstone of both safety and performance. Controlling the environment, keeping the floor clean and in good repair will insure a consistent surface. Longevity – A flooring system is a major investment. Take care of this piece of equipment and it will last many years. The better the care and maintenance, the longer the floor will serve you and your community of dancers. Dry mop your floor daily. Do not use a treated mop. Clean your floor weekly with a detergent/degreaser. Cleaning products created for home use are not appropriate for commercial and professional situations. They may need special protective finishes. The desired aesthetics and coefficient of friction are very different from your floors at home. You need a general purpose, mid-range PH (measures acidity and alkalinity) detergent/degreaser. It cleans without destroying finishes and without leaving any surface residue. Remove dye and scuff marks with a special solvent. Change top tape and clean with adhesive residue remover every three to four months. Disinfect your floor at least three times a year. Many cleaners leave a residue on the floor that make it shiny or resistant to dirt. When you use a cleaner that leaves a residue of any kind, you inevitably change the coefficient of friction. If you use the inappropriate cleaning agent, your floor becomes stickier or more slippery after application. If there is one thing you want in a specialty movement floor, it is consistency. Stagestep offers two detergent/degreaser products: Proclean and Proclean NS. Each can be used with a mop or floor cleaning machine, usually with an aqua pad, green or red (red pads are more aggressive) pad. The two bucket technique is more effective and efficient if you are using a mop. One bucket using warm water and containing the detergent/degreaser; the second bucket contains just plain warm water. Put the mop in the detergent bucket, wring out (you never want to excess water on any floor surface), and mop your floor. Rinse out the mop in the second bucket, then repeat. When you use most detergents/degreasers with a high concentration of water, you will not have to rinse your floor. Do not use plain water. It will not pick up body oils (sweat) or body lotion. ProClean is your basic “go to” cleaning solution. If your floor is very dirty, you may have to mop more than once or use a floor cleaning machine. Mix approximately 2-4 oz of Stagestep ProClean per gal of water. Apply liberally with the mop but do not flood. Allow solution to stand a minute or two then remove with a dry, clean mop (the mop must be rinsed in clean water prior to each pick up) or use a shop vac. Rinsing the floor is not necessary. Mix approximately 1-2 oz of Stagestep ProClean per gal of water. Apply, scrub and pick-up as you would ordinary low-foam cleaner. No need to rinse. For weekly use, use an aqua pad. For heavy duty cleaning usually every four to six months, use a green or red pad. Use 125 to 225 r.p.m. machine only. ProClean NS (Non-Slip) for floors that are both dirty and slippery. It leaves a safe chemical coating that builds up a non-slip surface as it cleans the floor. Always broom sweep or vacuum to remove course dirt. To increase the non-slip effect when using ProClean NS, you can apply repeatedly during the initial application: 2, 3 or 4 times. Subsequently, you will only need to apply it once a week. The floor should maintain the same level of “non-slipperiness.” A warm water rinse will remove the coating. Note: ProClean NS is not compatible with Slip NoMore 2000C. Use cotton or a cotton/synthetic mop. Use 2 buckets: One bucket for the ProClean NS solution, one bucket with warm water to rinse mop & wring out dirty water. Damp mop floor. Do not rinse. Allow floor to dry completely. Place the ProClean NS solution in to the feed tank of the automatic scrubber. The solution may be applied, scrubbed and vacuumed up in one step. Do not flood. Do not rinse. Allow floor to completely dry. For weekly use, use an aqua pad. For heavy duty cleaning, use a green or red paid every 4-6 months. Allow floor to dry completely. ProClean D Plus is your “go-to” disinfectant cleaner. Killing bacteria, fungus, algae, and viruses (e.g. effective against hepatitis-B-virus) and controls mildew. Use more often during flu and cold season or whenever you suspect that a number of your students have the sniffles or running noses. ProClean D Plus is suitable for non-porous, hard, washable water-resistant surfaces and objects such as walls and dance floors. Dilute solution 2 oz ProClean D Plus to 1 gal water. Mop onto floor surface which must remain wet for up to 10 minutes, then rinse. Do not flood mop. Treated surface should not be used until entirely dry. Note: Undiluted or insufficiently diluted ProClean D Plus will act as a stripper and may remove floor finishes that have been applied after purchase. Do not mix ProClean D Plus with other cleaning, anti-slip and/or disinfectant products. SimplyGone is a stain remover and cleaner for wood and vinyl that can be used over the entire floor or for spot cleaning. Just apply, agitate, wait five minutes and wipe off. It is non-flammable and non-toxic and has an unlimited shelf life. Apply liberally to mark. On stubborn marks agitate with soft brush. Wipe with a white towel or terry cloth. Repeat procedure if necessary. Rinse with water. Wipeout Plus is a spot and adhesive residue remover. Spray Wipeout Plus on a scuff or dye mark and leave on for 30 seconds. Wipe off and rinse with water. Repeat if necessary. Note: If your floor has a finish, it is possible Wipeout Plus will remove it. The faster you flush with water, the less likely this will occur. Wipeout Plus is very effective for removing adhesive residue left after changing top floor tape. Apply, leave on for a minute and wipe clean with a moist towel or rag. Note: If your floor is a total wasteland of scuffs and dye marks, and you used a finish on it, it might be time to re-finish the floor. The traditional scuff mark is a classic problem. Scuff marks are the black streaks typically left by footwear that has a hard rubber bottom, such as heels, hard-soled shoes, or sneakers. With the additional force of percussive movement, such as tap or clogging, the problem is compounded by the abrasive, burnishing, and grinding nature of the transference of materials to the floor surface. Normal cleaning procedures may not get the job done. There are two ways to address these problems and in some instances, a combination of both work well. Aggressive chemical cleaning agents that can dissolve and “lift” the marks off the floor. Mechanical means utilizing a floor machine, brushes and/or aggressive pads (red or black) to muscle the offending marks off the floor. Note: That which can dissolve foreign matter off your floor may very well dissolve your floor along with any floor finish you may have had on your floor. The first time out test any new product or technique. Read maintenance instructions for do’s and don’ts. Wipeout Plus and Simply Gone are products recommended for scuff marks. While scuff marks can be troublesome, there is a much more sinister problem that looks very similar. Dye marks are produced when heat and perspiration cause shoe dye to leach through the shoe onto the floor. It is like spilling paint. It is time for a spot solvent remover. There is an inherent problem where the substance that dissolves the dye mark can also dissolve your floor. The longer dye marks remain on a vinyl floor, the harder they are to remove. These marks will migrate directly into vinyl, making them almost impossible to get out. We recommend Wipeout Plus, a relatively safe and effective agent for picking up dye marks. Apply directly to spot, wait 30 seconds, agitate with brush or rough rag and flush with water to remove all vestiges of Wipeout Plus. Another type of mark that infuriates dance floor owners is the grey/black marks produced by disintegrating aluminum taps. Aluminum compound taps break down leaving a residue (the metal turns black when exposed to friction or heat) which ends up sticking to the vinyl and everything else. To preserve the quality of your floor use only steel or aluminum taps. Use artificial chamois cloth on the bottom of a broom and dry mop your floor. The shards of aluminum will stick to the chamois. Wash out the chamois cloth and reuse. Wet down the floor and use a wet/dry shop vac to dispose of the particulate matter. Note: Soap and water are ineffective in cleaning up this metal dust. Use TapShield after removing the tap residue to protect against a recurrence. Applied directly to taps, our unique product prevents the residue made from aluminum compound from getting on the floor. First the tap (new or used) must be cleaned with a green pad and sudsy water or with high grit/low abrasive sand paper, and then wiped dry/clean. TapShield is applied to each tap 4 times allowing the first 3 applications to dry for 15-20 minutes and giving the last coating overnight to completely dry and cure. You will want to prop up the shoes or turn them upside down. Mark the bottom of the shoe so you know it was treated. This coating should last a full season. TapShield is available in individual or studio size bottles. FloorShield Finish Cleaner should only be used on flooring which has been coated with FloorShield Finish. And equally, floors coated with FloorShield should only be cleaned with FloorShield Finish Cleaner. Always broom sweep or vacuum to remove coarse dirt. For heavy duty cleaning or after initial floor installation, dilute cleaning solution 1 part FloorShield Cleaner to 10 parts water (or more water if not heavily soiled). When cleaning the floor prior to finishing, you can use a red pad. Remove residue with a shop vac or dry mop rinsed in warm clear water to neutralize. For daily cleaning, dilute cleaning solution 1 part FloorShield Cleaner to 200 parts water. Mop floor using 2 buckets; one bucket with FloorShield Cleaner and one bucket with clear water for rinsing mop. Dilute 1 part FloorShield Cleaner to 400 parts water. Use FloorShield Finish to restore the surface appearance of your floor and cut cleaning time. It will reduce tap residue by up to 50%. The Floorshield Maintenance System includes a floor stripper for vinyl or a sealer for wood floors, the finish and a special cleaner. It also comes with microfiber rollers to apply the finish. Directions are on the bottles. It is recommended you call to discuss application protocol when ordering. Lasts up to eighteen months before reapplication is needed. Cleaning made easy with Stagestep Floorcare Applicator. Features a lightweight microfiber washable mop head and pre-loaded cleaning solution. Tired of pulling out the mop, bucket and cleaning agent? Then filling the bucket with water and dragging it into the studio or onto the stage? Just pull the trigger and spray the cleaner on the floor. The microfiber reusable mop head cleans and dries in one swipe. Great for spot cleaning and while on tour. Note: Not designed as your primary cleaning appliance. Every movement activity has an ideal coefficient of friction that provides optimum performance and safety. Unfortunately, it is different for every discipline. Differing footwear and activities change your perspective on the dynamics of your flooring surface. Tappers like fast floors. Ballroom dancers, fitness and athletic participants prefer even faster floors. Ballet dancers like slow floors. Faster floors have less coefficient of friction. The key to adjusting the floor to meet your movement needs is to assess the condition and maintenance of your floor. In many cases, floors get slippery or sticky because they are not being cleaned properly, or not being cleaned at all. In many other cases, humidity which is too high or too low will cause a floor to be too slippery. Clean the floor on a regular basis with appropriate materials. Does the floor perform better right after cleaning then deteriorate over time? If so, clean the floor more often. Use a detergent/degreaser or manufacturer recommended cleaning product. Many home cleaning agents contain chemicals that make floors more slippery. Ensuring the temperature and humidity are under control. Both can cause major changes in the coefficient of friction. Use a dehumidifier overnight if humidity is an issue. Dry mop the floor daily. If you find that your floor is still too slippery, Stagestep offers two products that make floor surfaces less slippery or slower: ProClean NS and Slip NoMor 2000C. ProClean NS, a multi-purpose cleaner and non-slip agent. Each time you use ProClean NS to clean your floor it adds a non-slip element to the surface. Slip NoMor 2000C, the original “liquid rosin,” is applied only after the floor is cleaned. With a dedicated mop and bucket, apply to the floor at the desired concentration of water to Slip NoMor 2000C. If the concentration is too strong, it will have a reverse effect and cause the floor to become more slippery. Remove with clean warm water prior to cleaning the floor with a degreaser/detergent such as ProClean. Then, reapply after cleaning. Be careful to follow directions, use separate mop and bucket. Note: Do not apply Slip NoMor 2000C without rinsing first. Mix 1 ounce of Slip NoMore 2000C per 20 oz of water, or approximately 6 1/3 oz of Slip NoMor 2000C to one gal of water. For slightly faster floors, decrease the ratio and mix 1 ounce per 22 oz of water, or approximately 5 ¾ oz to 1 gal of water. Apply with a damp mop and allow to air dry. Do not flood mop. You may have to experiment in finding to perfect formula for your floor. Slip NoMor 2000C must be removed with a warm water rinse prior to any wet mop cleaning. Note: Slip NoMor 2000C is not compatible with ProClean NS. Stopping the dirt, grime, foreign materials and wetness before it lands on your floor can save you time and money. Some of dirt and foreign materials that gets on your floor comes from outside your facility. Have indoor entrance mats both at your exit/entrance and at the doorway into the studio. These are pretty high tech items in that they scrape, remove dirt, and dry the shoe bottom just by walking on it. They can be installed as portable systems or recessed permanently. They eliminate about 80% of the outside particulate matter that gets on your floor. When rolled out, a series of waves run across the width of the floor that now will not lie flat. If your flooring has been rolled up, lying flat for awhile, been stored without a tube or has had weighted objects put on top of it, it is possible you have wave set. Roll the floor up the opposite way around a tube and keep it in a warm place for a day or two. Then, unroll to see if you have fixed, or at the very least improved, the condition of the flooring. Use heat (with caution) and pressure. A hair dryer is the best way to apply heat. Too much heat can damage your floor. Warm up a wave then put weight on it overnight. If it has not improved by the next day, you may have an unfixable floor. A major cause of floor surface problems is environmental. Softer surfaces can be damaged more quickly and most extensively than harder surfaces in a warmer environment. Certain colors and patterns can either show or hide scuff marks. There are floor surfaces and finishes that resist staining better than others. Issues regarding air quality, temperature, humidity, and static electricity impact the wear, comfort and consistency of your floor. Contain and control the environment to reduce maintenance. Humidity and temperature are two key factors in keeping your floor safe and clean. The warmer the room, the softer the (non-wood) floor surface becomes. The darker the color of the floor, the more heat is absorbed and retained. Non-wood floor surfaces can get so soft that heel impressions can become permanent. The floor becomes more vulnerable to cuts, abrasions and other damage. If your floor has been semi-permanently installed and gets much warmer than when it was laid, it will probably expand, bubble up, create waves, and have to be reset. If the floor gets cold, it contracts, gets harder and less flexible, increasing the possibility of cracking and fracturing. Temperature changes of 20 or more degrees can have a major impact on the viability of the floor surface when the floor was installed using tape. Temperature change comes about because of sunlight through windows/skylights, wind penetration at doors and windows, slabs and ceilings that are not insulated, heat given off by dancers, and erratic thermostat settings. Wood subfloors and surfaces are especially vulnerable to the effects of temperature and high humidity. Wood can cup, contract, warp and swell, resulting in excess wear and splintering. It also creates an environment where mold can develop. Most conditions that cause this kind of deterioration can be reversed, and the floor can be salvaged if addressed immediately. Call our technical support for assistance. Moisture can be both friend and foe to any performance surface/subfloor system. Too little and the floor can be a slip hazard, too much and you can have surface warping of wood or subfloor. High moisture and temperature can ferment mold and mildew. It is a balancing act that determines the overall performance of your floor, and the ability to maintain it. Caused by high humidity, unprotected concrete slabs, flood mopping or improperly functioning heating or air conditioning. 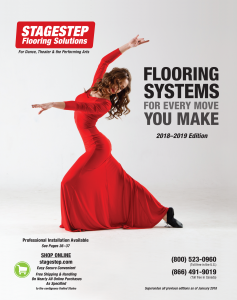 Excessive moisture can cause slippery floors, attract excessive dust and dirt, breakdown tape and adhesives, and lead to both surface and subfloor failure. When there is too much moisture in a room the humidity of the space will rise above the standard 40-60% needed to maintain a good dance floor environment. The air in the room will hold moisture throughout the day while the rooms are warm and in use (Typically the HVAC system handles the moisture in the air, but as humidity goes above 60% the system begins to fail). As the rooms cool down overnight or when not in use, this excess moisture will settle out of the air onto the floor surface—bonding with dirt, dust, body oil, hair products, skin creams, etc., creating a recipe that lowers the coefficient of friction and can turn any floor into an ice skating rink. In addition, the moisture will also begin to collect in the cool spaces beneath the subfloor, where excessive moisture can lead to the breakdown of wood, and the growth of mold. Moisture from concrete slabs is not unusual and can be addressed with a moisture barrier. Flood mopping where water and cleaning agents are poured directly onto the floor can cause water to seep into and below the subfloor and also evaporate excessive moisture into the room. High humidity areas are both a function of your geographic location and the overall health of your HVAC system. If you are in this type of location, have your HVAC inspected and be sure it is functioning properly. If all is good, and the in studio humidity is over 60% you will need to invest in a dehumidifier. (Note: Do not take the humidity below 40%). Caused by dry, arid locations, lower floor locations (basement) and improperly functioning HVAC systems. Floors become slippery from loose dry dust and other contaminants on the floor. Drying out of adhesive and tapes lead to bond failure. Increased risk or excessive static electricity build up which can lead to failure of sound system equipment and even possible injury from electric shock. Check your HVAC to make sure it is functioning properly and not removing too much moisture from your environment. Next, check that the relative humidity is between 40% – 60%. This is critical for a performance floor/subfloor to function properly. Adjust HVAC to allow for more humidity. Add a humidifier, this can be done with a stand-alone unit or one that is attached to your current HVAC system. Add blinds or drapes to block direct sunlight. Take dance shoes on and off in the studio to reduce transfer of outside dirt. Make sure room is insulated properly. In a dry atmosphere, usually caused by a heating system and or winter weather, the relative humidity drops. Friction caused by walking on carpets produces static electricity. A static electric charge can be painful and give you a shock. It can also blow out your sound system. Static electricity turns shoes into a dust and dirt magnet and the first slide, shuffle, skip or hop deposits a mess on your floor. Install a humidifier in your HVAC system and wet mop your floor in the morning before class to address this issue. Always roll the floor up around a core. We recommend a 4” diameter plastic tube available from Stagestep. Never transport or store floors on top of each other. Store and transport floors vertically, if possible. (For short term travel, floors may be stacked on one another but must be placed upright or unrolled as soon as possible.) Prolonged stacking will cause failure of the floor. Do not transport directly on pallets as the slats can cause indentations. Best to use corrugated cradles or other protective packaging. Always store your floor at room temperature, between 60°-80.° If your floor is exposed to cooler or hotter temperatures, let the floor acclimate to the temperature of the room where it is being installed, preferably overnight. If the temperature dips below 60,° it may become brittle and it is subject to cracking or breaking if dropped, struck or suddenly unrolled. Protect your floor when moving it from dirt, grime, and contact damage using bubble wrap, boxes, and/or plastic/shrink wrap. Stagestep offers touring bags. If you are using flooring outside, be careful of two sun-related issues. Excessive temperature will soften and expand flooring, making it vulnerable to damage. The sun emits UV radiation that will attack the plasticizers in the floor that make it flexible. Prolonged exposure to sunlight will cause your floor to become ridged, shrink and crack. Cover the flooring with a tarp when not in use. While water itself will not damage most PVC floors, it can create an ideal environment for mold. Immediately dry the floor and inspect for any mold spots. You should be especially concerned if you have foamed-back flooring because water can permanently damage the foam if not removed immediately. Never leave flooring outside without protecting it from the elements.